I first read F. Scott Fitzgerald’s classic book The Great Gatsby as a junior in high school. I didn’t particularly dislike it, but the fact that I had to write three essays over the green light and its symbolism didn’t make me like it either. My anticipation for this film was little; I like Leonardo DiCaprio well enough, but Baz Luhrmann as director and rapper Jay-Z as the man in charge of the soundtrack for a film set in the 1920s didn’t fly well with me. Despite this, I re-read the book two days before I saw the film and decided that I liked it a lot more this time around since I wasn’t having to read it for school. I became anxious…would the film do the book justice? Thankfully, I had little to worry about, as The Great Gatsby is a fine adaptation of Fitzgerald’s classic. This story is told from the point of Nick Carraway, played by Tobey Maguire, who moves to Long Island in New York, where he is the neighbor of the alluring, illustrious Jay Gatsby, a man whose past is as mysterious as his parties are extravagant. Across the bay lives Nick’s cousin Daisy Buchanan (Carey Mulligan), who is married to Tom (Joel Edgerton), a man born into a rich family who is known to be in an affair with a woman from New York. As the summer goes on, Nick and Gatsby develop a friendship that leads to Gatsby revealing a secret: he is in love with Daisy and has been for five years. When Gatsby and Daisy reunite and pick up their relationship where it left off five years previously, chaos ensues as relationships become strained, accidents happen, and hope seems forever lost. I hated the first 45 minutes of this movie. Everything seemed to be thrown into my face, one person after one event after one party after another, and I grew sick of it. The rap music fuels the parties, which I didn’t especially care for either. Of course, I can’t sit here and be unfair about all of this; every one of these aspects are results of creative decisions on the part of the director that make sense and probably worked for other people. This was the “Roaring 20s,” and all of this fast-paced delivery and bright color and extravagant music helps to emphasize the prosperity and free-spiritedness of the time. No, rap music wasn’t around in the 1920s, but I doubt that the inclusion of music from the 1920s would have communicated the wildness of these parties as well as the rap music does in this day and age, nearly 100 years later. I recognize all of this…but I just didn’t like it, and I was worried that the rest of the film was going to present itself in the same way. But it didn’t. Once we become acquainted with Gatsby and move into his relationships with Nick, Daisy, and Tom, the film becomes a character study that I couldn’t get enough of. DiCaprio as Gatsby is perfect – he captures all of the optimism, all of the warmth, and all of the anxiety expressed by the character in the book, never going too far in an attempt to make the character believable. The other standout performance comes from Carey Mulligan as Daisy, who appeared on screen just the way I had imagined her in my head whilst reading. Tobey Maguire also does well as Nick Carraway, though I must admit that I was worried going into the film knowing that the story was told from his perspective…I had nightmares about Peter Parker doing the voice-over while we watched Gatsby throw his parties. But Maguire did fine and was thankfully not channeling his inner Peter Parker, though you could argue that he never did that in the Sam Raimi Spider-Man films either…ha! There’s not much to be said about Joel Edgerton’s performance as Tom Buchanan except that he did an admirable job and that I liked the way he played the character. Having read the book less than 48 hours in advance of seeing the film, I can personally attest to its accuracy to the original book, with much of the dialogue being directly quoted from Fitzgerald’s text. In fact, I can’t think of anything off the top of my head that was significantly changed from the book, but the film still managed to not be a slave to the text, making itself stand apart as its own work of art while still capturing the themes of the novel. The symbolic green light, the light at the end of Daisy’s pier that Gatsby recognizes as the hope of being reunited with his lost love, is more present in the film than it is in the book, with it making several appearances throughout the duration of the movie. What’s more is that we hear the green light as well; every time it flashes in our view, we hear a single note swell from the instrumental score (composed by Craig Armstrong). One of my favorite parts of this film, though, is at the very end when we hear this note swell without seeing the green light – we’re hearing Gatsby’s flicker of hope that everything might still be alright in his future with Daisy, despite all that has just happened. It’s a powerful motif that resonates in both Gatsby and in the audience. The overall look of the film was dynamic and interesting, which I liked too. Had the first 45 minutes of this film been different, so might my rating, but that doesn’t mean that this wasn’t a great film well worth your time. In all reality, I think that I’m in the minority of people who don’t care for the music in this film, with the obvious exception of Craig Armstrong’s instrumental score (which, sadly, isn’t being released as a purchasable album) and, curiously, a jazz-ified 1920s rendition of Beyoncé’s “Crazy in Love” that fits into the film quite well. DiCaprio’s performance is fantastic (though, sadly, I don’t think he’ll walk away with an Oscar for this one either), as is Ms. Mulligan’s, and it’s so true to the original themes of the book that any fan of Fitzgerald’s original novel should definitely give this a watch. My experience with Quentin Tarantino films is pretty limited. Before this, the only one of his films that I had seen was Inglourious Basterds, which, I admit, I don’t remember much of because I was working on homework and such while watching. Despite that, my current quest to see all nine Best Picture nominees for the 85th Academy Awards brought me to Django Unchained, a film that I had meant to see quite a while ago but only just managed to watch. And wow…it was worth the wait. At the start of the film, Django (Jamie Foxx) has just been separated from his wife Brumhilda (Kerry Washington) after the two of them tried to escape from the place where they were slaves together. He is being taken to a new place to work, but plans change when a bounty hunter named Dr. King Schultz (Christoph Waltz) shows up looking for Django, who he believes can identify three men who have prices on their heads. Dr. Schultz doesn’t like the idea of slavery, so his relationship with Django is as more of a partnership, with him treating his new friend as a person with the same rights as he does. The pair embarks on a journey to first find these men and then others before they travel to the plantation of one Calvin Candie (Leonardo DiCaprio), who is Django’s wife’s new owner, where they come up with an elaborate scheme to buy Brumhilda back from Candie so that her and Django can be reunited and free together. For me, the best part of this film beyond a doubt is Christoph Waltz as Dr. Schultz. His dialogue is fantastic, his character is fascinating, and his overall onscreen likability is fervent. From the very moment in the film when he first appears, he takes control of the situation, managing to show both his aggressive and compassionate sides from the start. Throughout the film, he treats white and black people with the respect they all deserve as humans, which is hugely admirable amid so much racism and hatred. Foxx’s character is likable as well, with his obvious passion for his wife acting as his motivation for everything that he does or, in some cases, what he doesn’t do. In fact, there are several points in the movie when Django “sees” his wife with him, such as when he is bathing in a hot spring or while riding his horse to Candie’s plantation. This sort of hallucination seems to serve as a reminder that everything he is doing, whether it’s killing men for a bounty or ignoring the plight of the enslaved black men around him, is done with the purpose of reuniting him with his wife. As for DiCaprio’s character, I don’t have much to say about him aside from the fact that DiCaprio did a wonderful job with it. The action in Django is visually incredible, though it’s certainly overly bloody and gory. Bullets often pass completely through the recipient’s body in order to maximize the amount of blood spewed everywhere, and, while it’s certainly gruesome, it’s also quite a spectacle to behold. 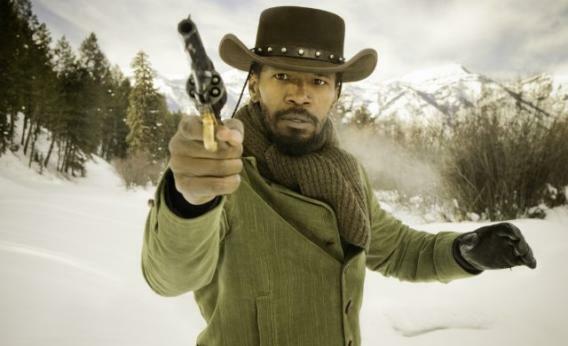 However, I do have one concern; in the last half hour or so of the film, all of the action is done as a mechanism of revenge from Django’s hand, and it certainly seems to be a bit overglorified. Django is supposed to be our hero, a man who would do anything for his wife, but the eventual acquisition of his wife (you knew it would happen, so I feel no guilt regarding spoilers) doesn’t stop the constant flow of killing and violence. It would have been nice to see him do what had to be done and then leave somewhat peacefully, but, of course, that doesn’t finish with enough of a bang for Tarantino, so he goes instead for something a little bit more…explosive. This concern, while certainly something to consider, does not overshadow everything else that is great about this film, though, which can be summed up in one word: “fun.” I had a great time watching this film throughout, minus a couple of scenes that were obviously not intended to be enjoyable, but that is another part of what makes it so good: it provides commentary on such important topics as slavery, racism, revenge, and love without losing its entertainment value. The movie lacks a traditional film score (as all Tarantino films do), but the music composed for and used in the film is excellent, and the style of the film is much in the feel of a Sergio Leone spaghetti Western…there is even a song written by composer Ennio Morricone, who composed the scores for Leone’s films. Overall, Django Unchained is a fine film with important social criticism, a well-executed script, and a talented cast of actors who make everything come together in an exceptional way. Despite the fact that the wreck of the RMS Titanic fascinated me as a child, James Cameron’s Titanic is a movie that I never bothered to see. My parents never spoke of it, we didn’t own it, and we never watched it when it came on TV, but I read about the Titanic itself at every opportunity I got; I recently found a book about the discovery of the wreck that I had bought at a book fair back in elementary school. In case you didn’t know, the 100th anniversary of the disaster was on April 14/15 of this year (2012), and James Cameron re-released Titanic in 3D to commemorate the anniversary. I decided that it was about time that I finally saw it, so I watched it for the first time 100 years to the day after the sinking of the ship…and I was astounded at how good it was. It’s little details like this that make me so appreciative a film that is otherwise considered a romance. Cameron does a fantastic job with highlighting the contempt between social classes on board, both before the disaster and during the sinking. We witness both the best and the worst of the rich, with some, such as Cal Hockley, assuming that his social status endows him with certain privileges, and others, such as Isador and Ida Strauss, dying together in bed so that they may stay with each other and so that others may take their spots in the lifeboats. We see the remorse that Thomas Andrews feels because he “didn’t build…a stronger ship,” and the regret felt by Captain Edward Smith at not having been more cautious. The most poignant moment in the film is when the musicians play “Nearer My God to Thee” as we see destruction, hopelessness, and death occurring in the ship’s final moments. I know that some may argue that Jack and Rose are the focus of this film, and I won’t disagree that their story is key to its success. Leonardo DiCaprio’s charisma as Jack is engrossing, and it’s his performance that drives much of the film. I sympathize with Rose in her situation with her mother and her fiance, and by the end of the film I am emotionally invested in the relationship between her and Jack. Through this unlikely pair we are given several life lessons: to “make each day count” and that love transcends money and social classes. This is a film that I fully expected to dislike, but seeing it on the big screen for the first time is an experience that I will never forget. It’s an engaging historical drama and a passionate romance film, mixed with outstanding visuals and a gorgeous score by James Horner. Judge me all you want, but Titanic is one of my all-time favorites.